Is Google Bigger Than You Think? Google is Big, Really, Really Big and it is bigger than magazines and newspapers. Possibly, that is something you assumed but hadn’t seen anything concrete. Well, here you go: $60 billion in revenue Big. 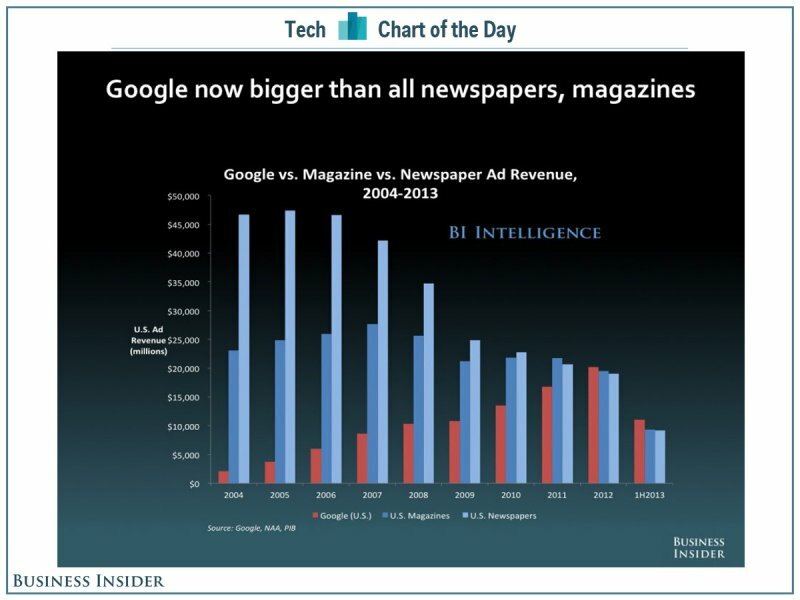 Google is NOW bigger than magazines and newspapers. And, Google is on track to be bigger than magazines ever were, even before they competed with the Internet. And, the majority of that revenue is coming from advertising profits. Google has successfully taken advertising dollars from magazines and newspapers – and, that absolutely includes the automotive industry. When’s the last time you read a paper magazine that you purchased? When was the last time you saw people sitting in your waiting area with a magazine they brought with them? Have you been told lately that someone couldn’t resist your double truck ad and had to come in ASAP? What is your digital budget vs. traditional budget? Let’s say, for ROI and dollars spent. Which one out performs the other? Before Google advertising, digital advertising in general, you easily could attest to traditional ad spend.